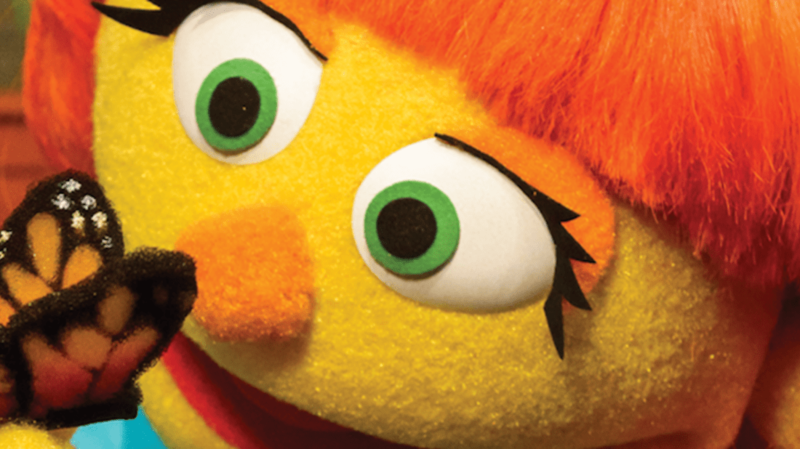 There's a new Muppet on Sesame Street: Julia. She's a "preschool girl with autism who does things a little differently when playing with her friends, the lovable Elmo, Abby Cadabby, and Grover," the Sesame Workshop told ABC News in 2015, when Julia made her debut—in digital form—as the face of a broad set of autism-awareness tools the Sesame Workshop had rolled out called "Sesame Street and Autism: See Amazing in All Children." But based on her popularity online, Julia is about to become a full-fledged Muppet when she joins the rest of the gang on Sesame Street in April. "If you're five years old, and see another kid not making eye contact with you, you may think that child doesn't want to play with you. But that's not the case," Sherrie Westin, Sesame Workshop's executive vice president of global impacts and philanthropy, told People in 2015. "We want to create greater awareness and empathy." The television version of Julia endeavors to do the same. "I think the big discussion right at the start was, 'How do we do this? How do we talk about autism?'" said Christine Ferraro, who has been writing for Sesame Street for 25 years, and has seen the number of children with autism increase during that time. To make sure they get the character just right, the Sesame Workshop has enlisted the services of Stacey Gordon, a puppeteer and mom who has a son with autism. "It’s important for kids without autism to see what autism can look like," Gordon told 60 Minutes' Lesley Stahl. "Had my son’s friends been exposed to his behaviors through something that they had seen on TV before they experienced them in the classroom, they might not have been frightened. They might not have been worried when he cried. They would have known that he plays in a different way and that that’s OK."
Julia is one of many Muppets who have tackled serious issues. Over the years, Sesame Street has featured Muppets who deal with food insecurity, malaria, visual impairment, parental incarceration, bullying, and living with HIV. Welcome, Julia! We're glad you're here to be amazing with us.